The team practicing rigging for crevasse rescue. Checking the slope angle with an inclinometer. 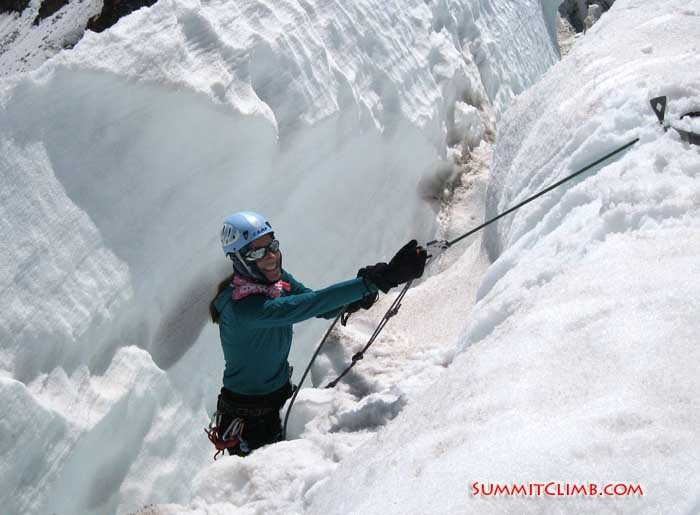 Autumn Glacier School: September 21 – 28, 2019 Learn ice and snow camping, mixed climbing, and make a summit attempt via the Disappointment Cleaver Route. Winter Camping Glacier School: January 1 - 7, 2020 Learn snow camping skills, avalanche awareness, glacier travel, and ice climbing. Winter glacier school does not attempt the summit. 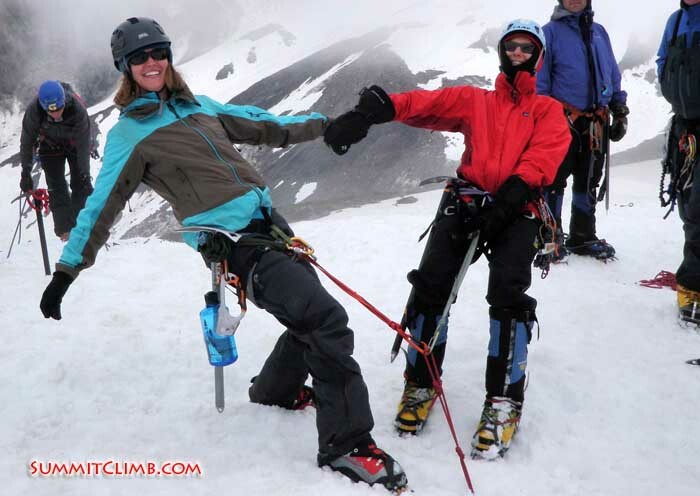 Spring Glacier School: May 16 - 23, 2020, learn ice and snow camping, mixed climbing, and make a summit attempt via the Ingraham Direct Route. Free! — Winter, spring, and autumn are offered at no charge. A free one or two-day glacier and ice travel refresher courses are available with Dan Mazur and staff upon request. High-altitude mountaineering requires skills that can only be harvested on the unforgiving face of a glaciated mountain. 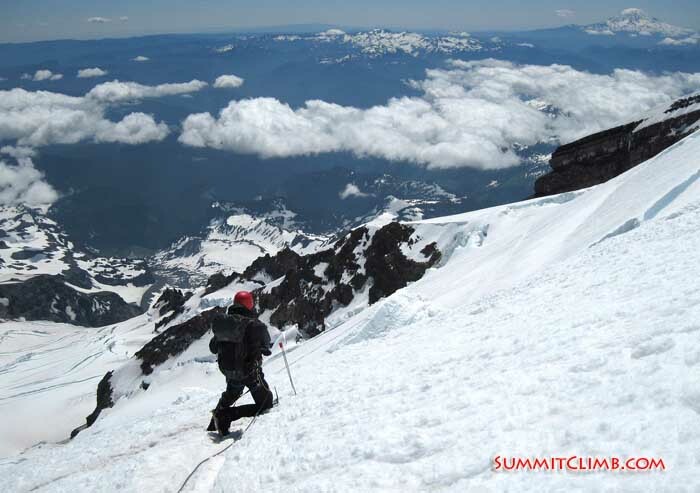 Learn the skills necessary to cross gaping crevasses and climb to the summit Mount Rainier 14,411 feet (4,393 meters) under the guidance of SummitClimb volunteer leaders, such as Dan Mazur. Members spend a week with the SummitClimb staff preparing gear, learning, and practicing glacier travel skills in the Mt. Rainier National Park. This course is ideal for those looking to meet new climbing partners, practice skills, and learn both classic and modern techniques. We provide a school free of charge in order to encourage people to join the climbing community and be inspired by the mountains. We also want to get people who might already be familiar with the sport of mountaineering to come out and share their knowledge with the group. This school serves as a steppingstone for perspective climbers to see how they feel at altitude and test out their equipment. Feel free to come out, ask lots of questions, meet and climb with the expedition leaders of SummitClimb. Day 1 - Arrive at Sea-Tac International Airport and make your way to Olympia Washington. Members may choose to camp in the expedition leader’s backyard/ garden, or we can advise members on a local hotel at your own expense. Day 2 – We start the day with some of the coffee or tea, and then meet the group for a mandatory meeting at 8:30. After breakfast at a local café, the expedition leader will check the members’ equipment and clothing. Next, the group carpools up to Seattle where participants can buy, try out, or rent equipment at many of the reasonably priced shops like Ascent Outdoors or REI. We will finish the day with dinner at a local restaurant before making our way back to Olympia. Day 3 - We pack our rucksacks and cars in Olympia and caravan to the Mount Rainier National Park. Along the way, we will stop at a grocery store for last minute food shopping. At the park, we start by getting group gear sorted and permits organized. After learning and practicing snow travel techniques, we will arrive at the glacial moraine where we set up camp, cook dinner, and get a good night’s rest for school the next day. 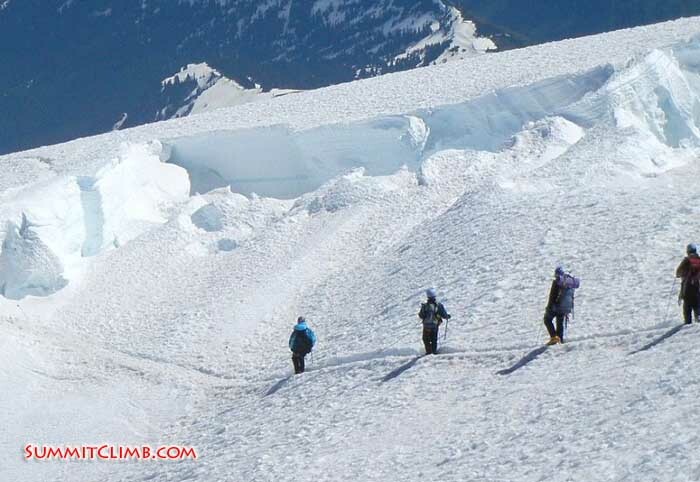 Day 4 - After an early breakfast, we go over roping up and walking as a team on a glacier. We climb some of the hills surrounding camp and practice building snow anchors. We finish the day by practicing self arrest and glissading with our ice axes as we descend back to camp. Day 5 - After a morning breakfast, we pack up our camp and spend the day moving through the clouds to the upper mountain where we will build a high camp in preparation for our summit attempt. The path is up a variety of non-technical snow terrain with excellent views of the surrounding glaciers. Day 6 -We use the technical icefall near camp to teach crevasse self-rescue techniques in the morning. We end the day early so that we can melt snow and fill water bottles for our evening climb. The leaders spend the rest of the day answering any questions that have come up over the week. Day 7 - We will walk through the night, taking advantage of optimal snow conditions as well as using all hours in the day, hopefully arriving at the summit before lunch. 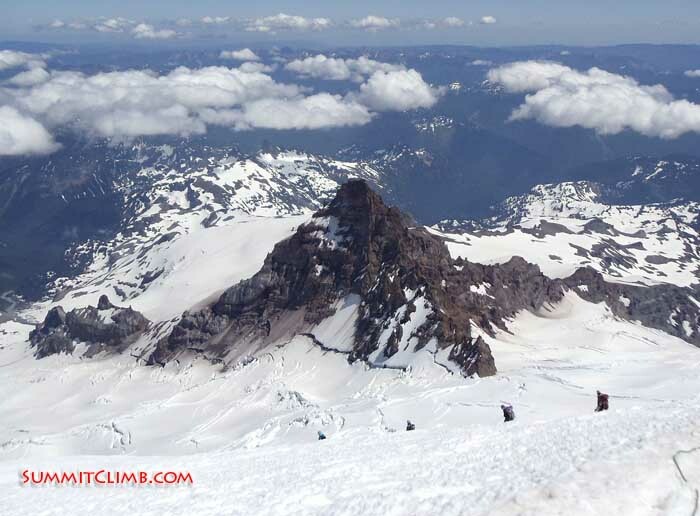 The route has steep snow to 40 degrees and includes portions of volcanic rock that we will scramble over to gain the summit ridge. After arriving at the summit, we can celebrate, and rest in the crater for bite to eat. We walk back to camp while enjoying the alpine vistas, pack up our high camp, and head back to the parking lot for the drive to Olympia. Some members choose to head back to Seattle this day, but do not schedule a flight on day 7 as we may get in very late. Day 8 - We have a final group breakfast in Olympia, and we say goodbye to new friends, then make our way to the airport for our journey home. All members must participate in the full 8-day itinerary. It is not possible to arrive later, nor is it possible to depart earlier. We are not able to accommodate people who wish to arrive in Seattle earlier, nor are we able to help those who wish to stay later. If you choose to make a longer trip, you will be "on your own". We ask that you arrive at Daniel Mazur's house in Seattle during reasonable hours, that is, before Midnight on Saturday. 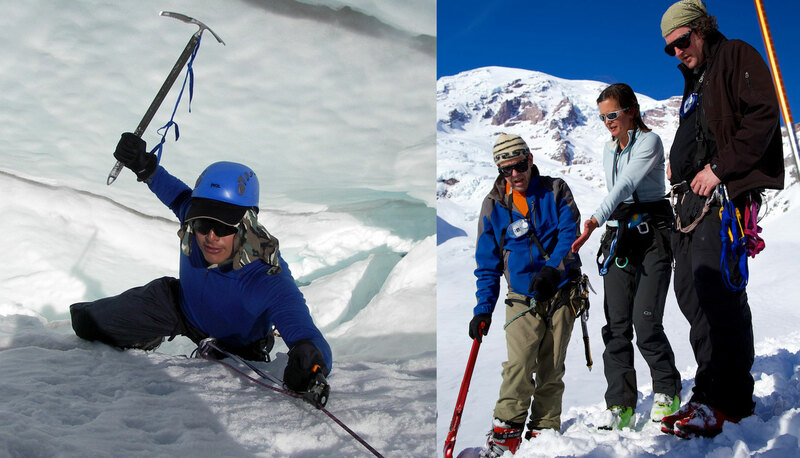 The expedition leaders of the Seattle Glacier School have teaching experience on all seven continents, have organized multiple Himalayan expeditions, and are happy to share knowledge with people of all abilities. 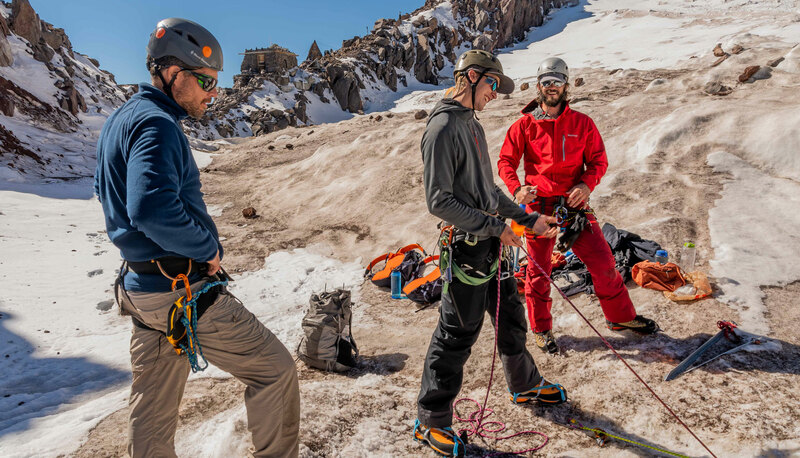 During the glacier school, leaders will be close at hand to help you with alpine cooking, building a comfortable home in the snow, explaining technical mountaineering skills, and answering any questions that you may have. 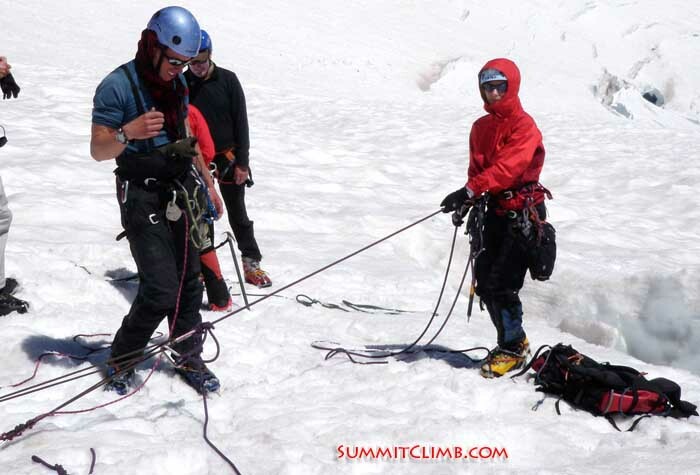 Throughout the school, you will be climbing with the leaders of Summitclimb, but you will also be close to some experienced climbers that have come out to join us as well. With so much knowledge around even the most experienced of climbers are bound to get new useful tricks out of the school. Dan Mazur, senior expedition leader, will be leading the glacier school. Dan is a relaxed, friendly and organized person, and a highly-skilled professional with years of experience in getting people to the summit and back down with the highest attention to safety. He has been leading and organizing successful and safe overland, trekking, and mountaineering expeditions for 20 years, to Tibet, Nepal, Tadjikistan, Pakistan, India, China, Africa, and North America. Down insulated puff jacket / parka with a hood. Double boots. Modern composite or plastic boots. Trainers, running shoes, or sandals. For walking around Seattle, or taking a break in camp. At least 1 closed cell foam kari-mats. If you want to bring an inflatable make sure that you also bring a puncture proof foam pad as well. Extra prescription glasses or contact lens supplies. Contact lens wearers, please bring glasses in case of emergency. 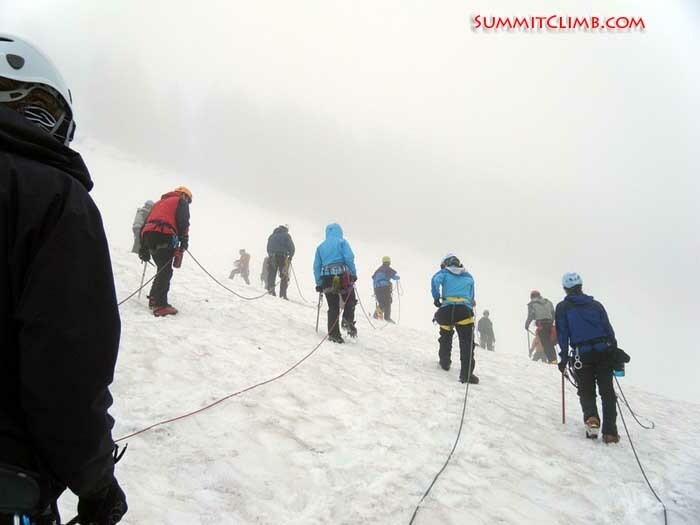 SummitClimb will provide group gear to use throughout the school. You may borrow one of our expedition tents. Participants may borrow stoves from SummitClimb, however fuel may need to be purchased. Leaders will organize climbing equipment like pickets, flukes, and ice screws to experiment with during classes. Participants will carry their personal gear as well as some group gear. Stronger participants will carry more of the group gear than smaller members, but you should expect to carry around forty to fifty pounds. If you enjoy walking outside with a backpack for three to six hours with twenty minute breaks thrown in, then you should have no problem on this trip. Please fill out the online request information form . Please be sure and tell us which expeditions you are interested in and mention your experience qualifications, etcetera. Please send us your email, postal address, and telephone number (which will remain absolutely confidential, we never share your addresses, phone numbers, or any personal details). 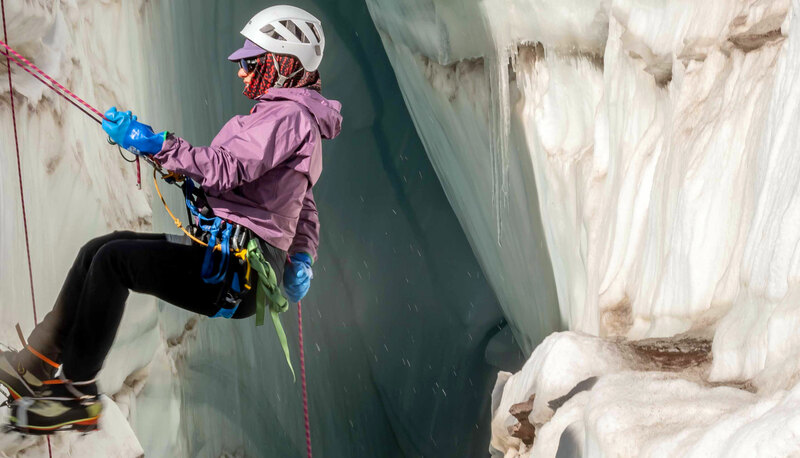 Complete the international or US glacier school climbing application form. Carefully read all of the associated information here on the website, ask questions and discuss it with us, print out your application from this website, then complete, sign, and post the application forms and we will tell you 60 days prior to school if you are accepted. This is not a guided trip. 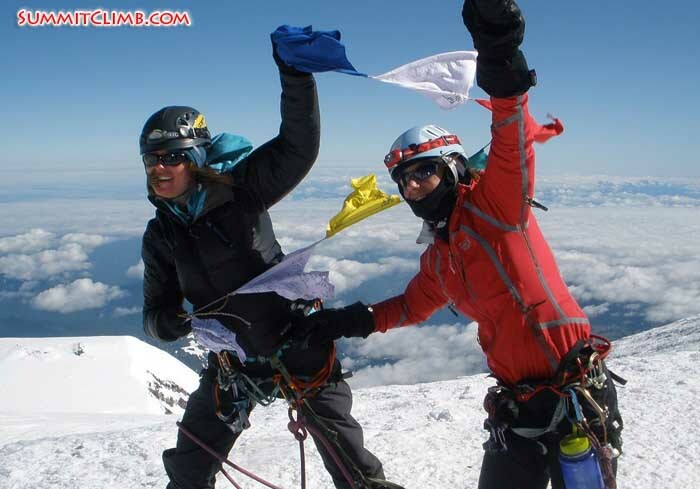 We are friendly and highly experienced expedition leaders, climbers, and trekkers. 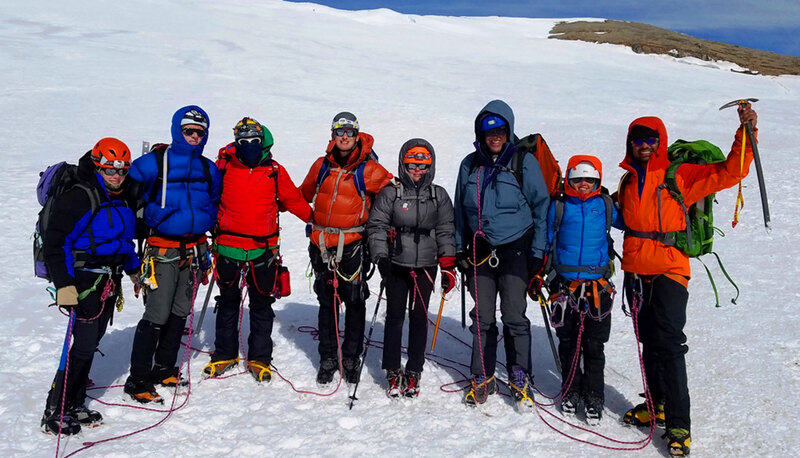 We have a 20+ year track record of building high-quality, safe, friendly, and fun climbing and trekking teams and successfully placing our team members on the summits all over the world. 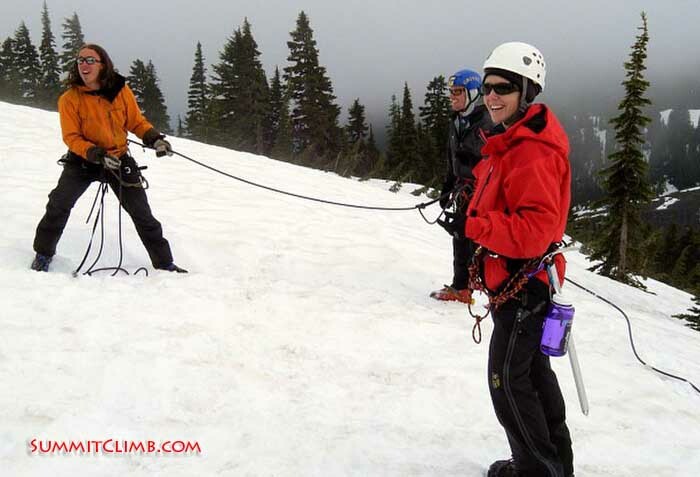 Our leaders are not licensed guides, but some of the most qualified mountain specialists available. We are there to assist the entire group. No previous technical mountaineering experience is required for the school, but previous camping experience is necessary. Members should be comfortable living outside for the week, staying in a tent, and cooking their own food. 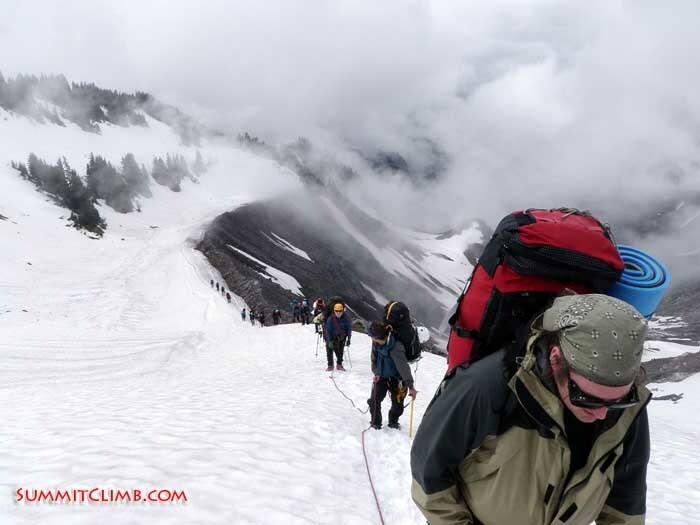 Since we are not allowed Sherpas, participants will carry their personal gear and pitch in with group gear as well. Stronger participants will carry more of the group gear than smaller members, but you should expect to carry around forty to fifty pounds in your rucksack. If you enjoy walking outside with a rucksack for three to six hours with twenty minute breaks thrown in, then you should have no problem on this trip. If you are in good shape from regular exercise, it is likely you are already prepared to enjoy this course. If you feel like it would be in your best interest to exercise before the trip, there are some fun training tips below. In the beginning, to see how you handle the training, and to avoid muscle strains that could slow your training down, you may wish to use shorter more frequent but less taxing workouts, and take more rest. After you get “up to speed” as it were, you could increase the rigour. Older walkers, please take note of the latter. Also remember that swimming is a fun and excellent form of training because it does not put stress upon your joints. In order to train well for your trip you should work toward exercising a few times a week for about 30 minutes each time. Adequate rest and a well balanced diet are also essential to avoid injury and illness before the trip. You should sleep at lease 8 hours per night, and eat three nutritious meals a day. Don’t forget that you will perspire when you train, so try to drink lots of water. Utilizing both gym equipment and the great outdoors will provide more balanced exercise. You should try to accomplish at least half of your workouts outside. This could include walking, running, and cycling, but above all should be fun! Hillwalking with a pack weighing 5-10 kilos / 10-20 pounds is a good preparation for trekking. Remember that, above all, trekking is fun and you should always enjoy yourself. We recommend that you shop carefully and frugally for your clothing and climbing equipment. 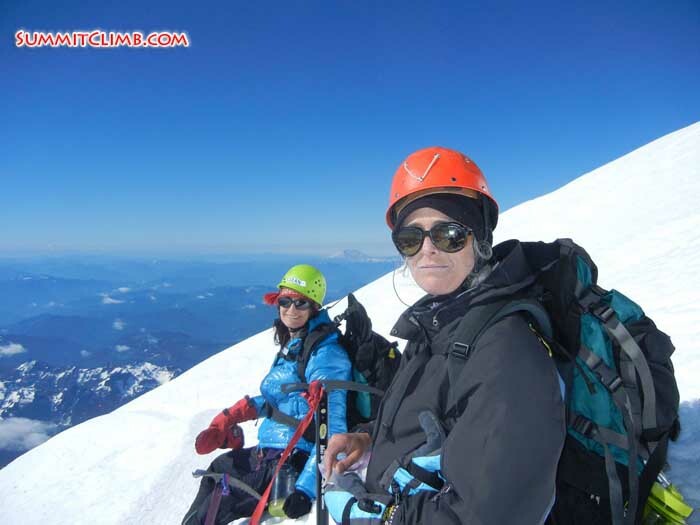 We will go shopping at mountaineering stores around Seattle, which offer excellent equipment at reasonable prices, as well as a large selection of rental equipment. If you are unsure of your clothing and equipment wait until you get to Seattle as there will be plenty of time to rent or purchase new and used gear during this shopping day. We will let you know if you are accepted into school 60 days prior to start. If you choose not to come or change your mind please let us know as soon as possible so that we can allow one of the other applicants on the waiting list to participate. We encourage you to join us as an individual team member. Most of our members join as individuals, our team dynamics work well, and we are able to build successful and safe groups of people that enjoy climbing together. The free school is a great place to meet new friends and future climbing partners. 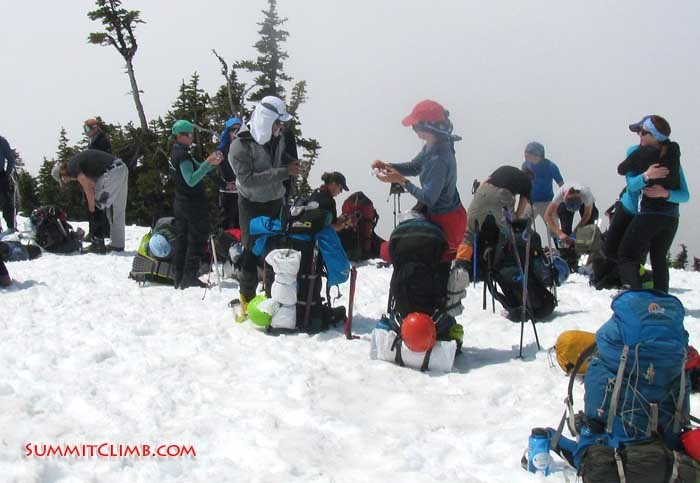 We send out a newsletter with all of the logistics for your arrival in Seattle approximately one month prior to the expedition. At this point, we usually share your email with the other team members, so you may meet one another and set up helpful logistics with one another. No major vaccinations or necessary to travel to the United States. You may check with the U.S. State Department if you are concerned about a specific country or a specific question. There is no cost to this school, so no need to send money to Summitclimb. However, please bring cash (no more than 100 dollars) for camping and permit fees and be prepared to pay for equipment rentals, food and lodging. One of our lead organizers is the very experienced, Dan Mazur, trekking in Nepal since 1986 and climber-leader-organizer of Everest, K2 and 12 “eight-thousand-metre-peaks”. He is relaxed, friendly and well organized. Dan is a highly skilled professional with 25 years experience in helping people explore the mountains, with the highest attention to detail, comfort, and safety. Please click here to view the Seattle Glacier School leadership page for more about our leader, organizer, sherpas, and staff. Members are men and women from around the world who enjoy touring, walking, climbing, camping, and being in the mountains with friends. Our youngest member was age 18, and our oldest 67 years of age. The average age is 38, with many members in their 20s, 30s, 40s, and 50s. We have neither a lower nor an upper limit on group size. Please note; We seek out members who can bring to this expedition a friendly spirit of team-work, as high altitude climbing and trekking are all about cooperation and working together and getting on with your team-mates. We recommend that you split a tent with one of the other members of the group for the school. This will make it easier to carry up the mountain. You may choose to bring your own single person tent, but Summitclimb only provides large expedition style tents. The group will be between 10-18 people depending on how many people apply and how many leaders we have on staff to help. The larger the group size the more leaders and assistant leaders will be added to accommodate the team. The ability to ask as questions to experienced professionals and share your knowledge. Please click here to see the link to our detailed itinerary. Please click here to see the link to our route description. The temperature and weather in the Pacific Northwest is normally mild. The maritime climate means that mist and rain happens frequently, however in the summer it is normally drier. Expect temperatures in town to be 20 degrees C / 70 degrees F, and expect temperatures on the mountain to drop down to -6 degrees C / 20 degrees F on average. Sunny days on the glacier are warm however, and normally when we are teaching the school, a lightweight jumper works fine. The evenings and the night when we are bundled in our sleeping bags are generally the cooler times. If you are in good shape from regular exercise, it is likely you are already prepared to enjoy this course. If you feel like it would be in your best interest to exercise before the trip, there are some fun training tips below. In the beginning, to see how you handle the training, and to avoid muscle strains that could slow your training down, you may wish to use shorter more frequent but less taxing workouts, and take more rest. After you get “up to speed” as it were, you could increase the rigour. Older walkers, please take note of the latter. Also remember that swimming is a fun and excellent form of training because it does not put stress upon your joints. In order to train well for your trip you should work toward exercising a few times a week for about 30 minutes each time. Adequate rest and a well balanced diet are also essential to avoid injury and illness before the trip. You should sleep at lease 8 hours per night, and eat 3 nutritious meals a day. Don’t forget that you will perspire when you train, so try to drink lots of water. Utilizing both gym equipment and the great outdoors will provide a balanced exercise. You should try to accomplish at least half of your workouts outside. This could include walking, running, and cycling, but above all should be fun! 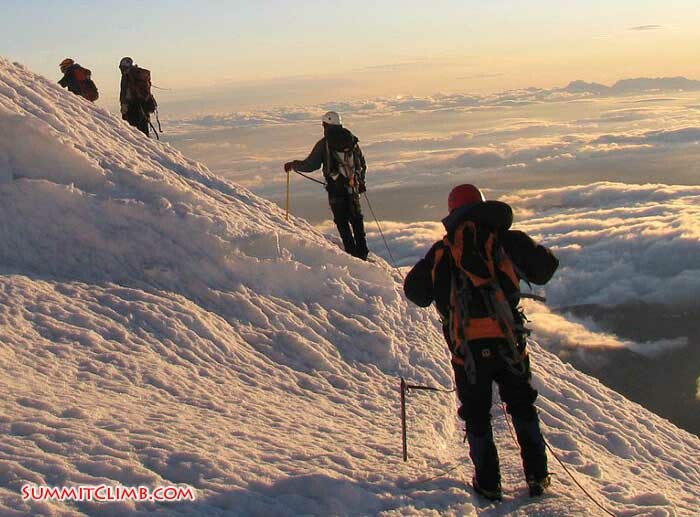 Hillwalking with a pack weighing 5-10 kilos / 10-20 pounds is a good preparation for trekking. You will need to provide your own food and snack/energy food. Food may be purchased during our Seattle shopping day and at the supermarket on the way to the mountain. High altitude drugs are not necessary for the Seattle Glacier School due to the short time at a high elevation and quick retreat. Our leaders are highly trained and extremely experienced in diagnosing and treating illness and injury in the mountains, and are well equipped with extensive medical kits. You will not need to bring large amounts of medicines. Over the counter painkillers, like Aspirin, and other over the counter medications that you use will be fine. Please bring any personal medications you take as well. Over mittens are necessary for summit day. The rest of the school we recommend a liner glove and a working glove. Gloves are easier to manipulate things, and tie knots, however water-proof over-mitts are necessary for being comfortable in the cold on our summit attempt. We recommend something that is small and easily packed. Small handheld cameras that fit in your pocket will be easier to access during the ascent. You will be carrying all the equipment that you bring for the mountain, so if you choose to bring heavy bulky photographic equipment you will be responsible for carrying it. Please click here to see the equipment list that you should bring to the school. If you do not have this equipment, you may purchase or hire /rent it on the Seattle shopping day. We devote an entire day in Seattle to acquiring the equipment and clothing needed for the school. Some members don’t show up with much equipment and buy most of their kit in Seattle with the advice of the leaders. Seattle has many reasonably priced stores where you can purchase or hire new and used equipment. Plastic Boots are 14 dollars for the first day and 8 dollars each additional day. Ice axes are 10 dollars for the first day and 4 dollars for each additional day. Crampons are 12 dollars the first day and 5 dollars each additional day. Trekking poles are 6 dollars for the first day and 3 dollars each additional day. Helmets are 6 dollars the first day and 3 dollars each additional day. All equipment rentals do not count the day the it is rented or the day that it is returned. Seattle is a large airport with many international flights, that is easily found online. The Seattle Tacoma International Airport is abbreviated by SEA. We think that it is best to book your ticket online through a website like Orbitz, Kayak, or Priceline. We can connect you with a travel agent if you would like, however we have found that people are finding the best deals by themselves online. You will need to provide your own transportation to the leader’s house for our group meeting, which occurs at 8:30 in the morning on day 2. You may hire a car, pay for a ride, or carpool with another member in order to make your way to the meeting. You will need one internal frame rucksack that should be at least 70 litres / 4,500 cubic inches. This will be the only bag that you will use while you are on the mountain. Some members choose to have a second duffle that they leave at the leader’s house or locked in a vehicle in the parking lot, however this isn’t a necessity. Full-coverage insurance is essential, because it not only covers mountain climbing, but also travel to and from the mountain. This could cover you for lost bags, a car accident on the way to the airport, etcetera. BEFORE PURCHASING, BE SURE TO REQUEST A COPY OF THE POLICY AND BE SURE TO READ AND UNDERSTAND IT. You must be covered for travel, full domestic rescue, helicopter (where available) and international rescue and repatriation expenses. In UK, Europe, South America, Asia, the Antipodes, many of our members are now using a company called Global Rescue, http://www.globalrescue.com , which can be combined with a standard travel policy, such as InsureMyTrip.com , CSAtravelprotection.com , or TravelInsuranceDirect.com.au. • http://www.snowcard.co.uk/ for UK members only (this only covers mountaineering up to 7500 metres if you get "expedition" coverage). In the US and Canada, your total full-coverage insurance package may vary, depending on trip duration and amount of coverage. We have seen several companies that offer comprehensive plans for travel and mountain rescue. A company called STA Travel is worthconsidering: http://www.statravel.com/travel-insurance.htm . Many of our members are now using STA insurance. Please make sure to get their 'medical', and 'non-medical' options to be fully covered. Another company is Global Rescue, http://www.globalrescue.com , which can be combined with a standard travel policy. 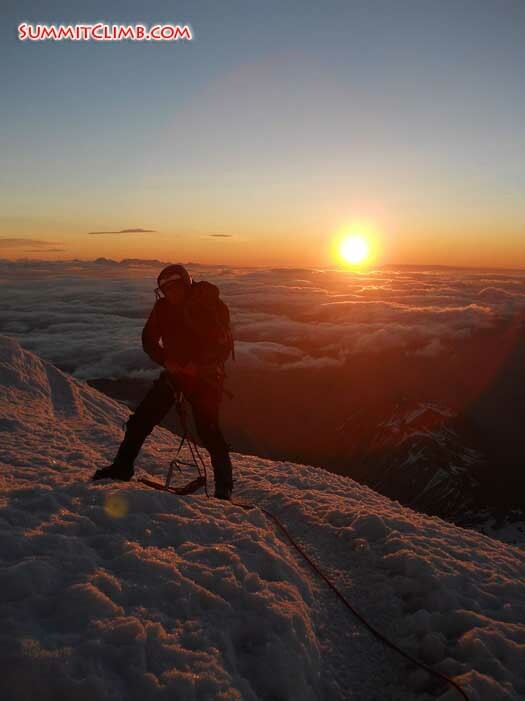 Our methods and equipment used in expedition climbing and trekking are time-tested over more than 20 years. 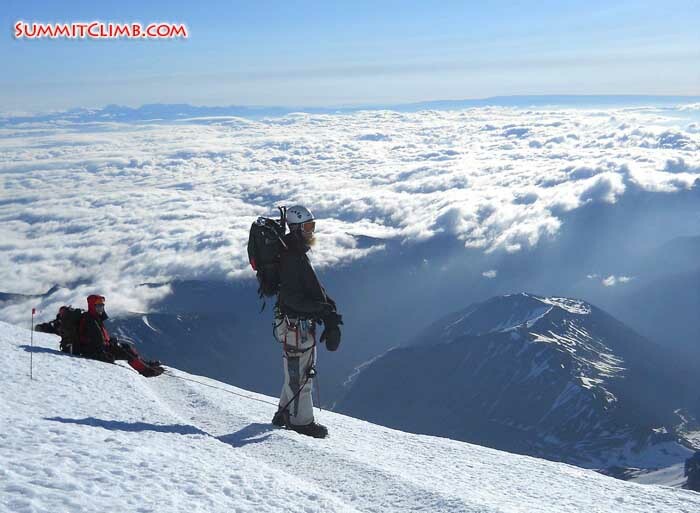 We do not spare expense and have a complete range of equipment and very in-depth knowledge and experience in the use of lead and fixing ropes, rock-ice-snow anchors, rescue equipment, communications equipment, full-climbing equipment for safe ascent and descent, cookers, a vast array of tents (both used and used), high-altitude camping equipment. Our philosophy is one of "It is better too bring too much than not enough". We believe that our philosophy of being extra prepared is one of the key factors in our long tradition of successful ascents. Our leaders are highly trained and extremely experienced in diagnosing and treating illness and injury in the mountains, and are well equipped with extensive medical kits. We will be staying in a tent that you carried while we are on the mountain. You may choose to borrow one of the expedition tents from Summitclimb to use for the duration of the school, or you can bring your own. We will be camping on snow and living in the tent for the entire duration of the school. You will be able to charge your electronic charger while you are in Seattle and at the leader’s house. When you are on the mountain there will not be any chance to charge your electronic devices. Fill out the application as soon as possible and send it back to us to be put on the waiting list. We will contact you know 60 days before the school begins if you are accepted into the program. 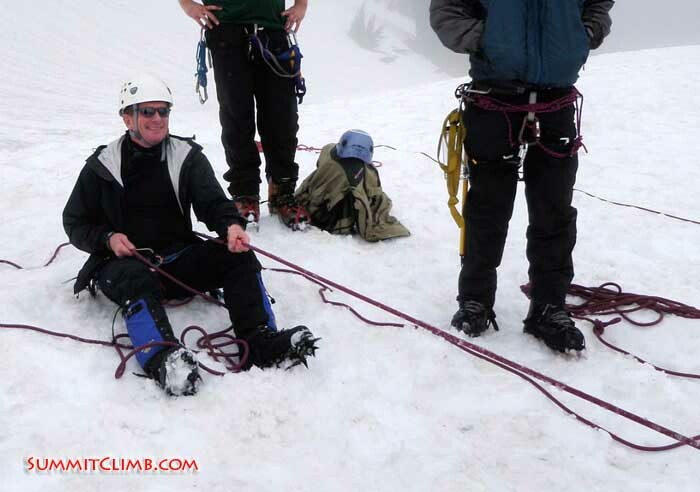 Here is what Brent has to say: Everyone, It was great climbing with everyone and I thoroughly enjoyed myself. If anyone wants to climb out here in the Great Northwest in the future, contact me and I will be happy to climb with you or just get you the latest route beta. That goes for rock, snow, ice and alpine routes.